Unlike most traditional surf kayaks, the new Fluid Element has its roots in both whitewater playboats and traditional ocean surf kayaks. With the ability to surf river and ocean waves, as well as the stoutness of a modern playboat, look to this offering as a maneuverable and versatile addition to your quiver. While the shorter length (6’7”) adds to increased maneuverability and the ability to throw fast freestyle tricks, it also makes it slightly slower than longer hulls. But with dialed-in stern release edges, the Element gains the ability to throw more playboat-oriented tricks. Pronounced carving rails that get progressively harder towards the stern give it the ability to make fast directional changes, and its quick release attributes let you pull off grinds and spins effortlessly. The Element also has a very pronounced bow rocker that helps with take off and when surfing steep waves. With a peaked stern volume its designers maintain it releases easily at low speeds and in choppy conditions. As with playboats, its seating position places the knees spread out instead of together as with more traditional designs. The Element uses the optional 4WFS fin design (fins purchased separately) that allows the fins to be positioned at different splay angles. The 4WFS design also carries one of the widest varieties of fins on the market. The quad fin system allows the fins to be much shorter, both protecting them from rocks and also allowing easier entry into shallower waters. Our take? 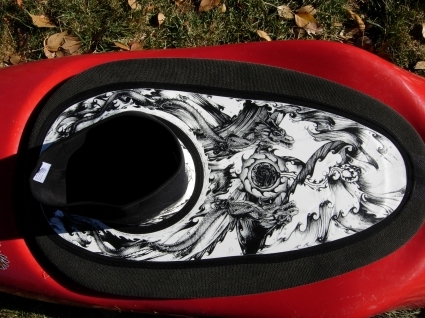 The Element’s unique design may change the face of surf kayaking, just like tandem whitewater canoes change relationships. Paddler weight range: 140-210 lbs. Bomber Gear calls this baby the most advanced whitewater spray skirt around. Indeed, its top of the line K-Bomb® stands up to rolling, rapids and wave bombardment. Supper stretch rubber allows the skirt to form fit the cockpit, lying deep in the boat’s combing to prevent deck caving. This year the company added Sub-Screen™, a water repellent and abrasion resistant ink that has super stretch and amazing style. The screen seals all the pores in the neoprene making it bone dry to the touch no matter the conditions. Kevlar-reinforced combing gives the skirt added strength and resistance, and combined with the super stretch rubber (Cordura reinforced combing on the Bombshelter) this makes the skirt one of the most versatile on the market, making it able to go from any cockpit size without stretching and losing shape. Also, included is the WickClip™, a feature along the grab loop that lets you clip it to your life jacket so every time you get off the river you don’t have walk around with water filling your booties. If you come across a lonely Joey kangaroo, you can even give him a ride in your pouch. With the crazy graphics on top and the strength and quality of the materials underneath, this skirt lives up to its name. The Maori Hei-Matau necklace by Wanderer Imports may not guarantee that the water conditions will be perfect, the weather will be just to your liking, or that you’ll nail your roll. But it is rumored to grant safe passage to all who wear it. Shaped by traditional Maori designs, the necklace is made out of cow bone and attached to an adjustable leather cord hand made by independent craftspeople in Bali. The Hei-Matau to the Maori also represents strength, prosperity, fertility, and a deep respect for the sea. With time, the cow bone material develops a golden sheen created by the absorption of oils from the skin. At only $15.95, these necklaces would make a great gift to a friend or loved one who needs that extra protection on their next aqueous adventure. Next articleTeva Mtn Games Founder to Work For…Teva!